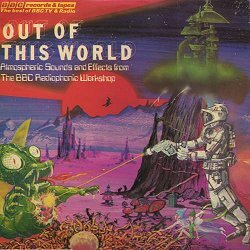 The sounds on this disc have been chosen from the many created for radio and television programmes at the BBC Radiophonic Workshop. Abstract sounds such as these can be far more atmospheric and less distracting than conventional music and effects in many situations and yet they are quite difficult to create without a certain amount of technical equipment and know-how. So I hope that amateur dramatic groups and film-makers will find this selection a useful addition to their sound stage. All the sounds are concerned with the unreal, the supernatural, with things that, if they do exist, are still only in the realms of the imagination for most of us. Some of them - the LASER guns, the space ship - can be used in the same way as conventional sound effects, but many are "atmospheres" and should be used as a musical background to any action. I have divided the disc into four sections and chosen the titles of the bands for easy reference, but the impressions created by sounds like these are very subjective and so if you fail to find the particular sound you want in the most obvious section, look elsewhere; it is quite likely there will be something you consider suitable in an unexpected place. It helps to experiment by playing things at different levels, as some sounds seem to change completely when played loudly or softly. Sounds are more easily controlled if they are first dubbed onto tap in the order required. If the band you have chosen is not long enough, you can either dub it off several times and cut out the gaps in between, or make a tape loop. Do this by recording a suitable short section , cutting it out of the tape , joining the two ends and holding it gently under tension so that it passes smoothly against the replay head, The resulting continuous sound may then be recorded on another machine. and television productions, through sounds for poetry and science-fiction to signature tunes and experiments in stylised stereophonic sound. The Workshop, at the BBC Studios at Maida Vale, London, is equipped with tape recording machines and other electonic equipment for generating, manipulating and synthesisng sound. The composition and realisation of this music and sound is done by a small number of specialised creative staff. - Desmond Briscoe, organiser, BBC Radiophonic Workshop.